The first step in creating a multi-pose rig is to create the main chain for the additional poses. In the Timeline view, make sure the time marker is set to the frame displaying your first drawing. 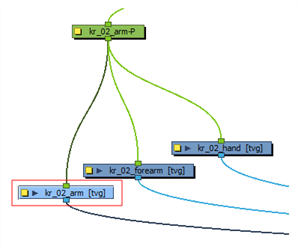 In the Node view, select the drawing layer containing the drawing you want to create the chain for. If you want to create the chain for an arm composed in multiple pieces, you must select only one of the drawing layer, such as the upper arm. The additional pieces will be added afterward. In the Deformation toolbar, click the Create New Deformation Chain button. A new deformation chain is created and appears in the Transformation Chain drop-down list. 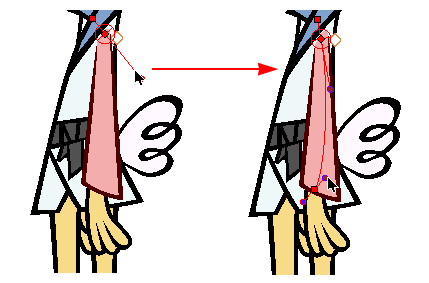 In the Deformation toolbar, select the Rigging tool. Create your deformer structure—see About Chain Creation. 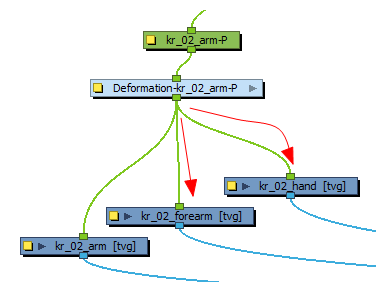 If needed, in the Node view, link the new deformation group to the additional pieces, such as the forearm and hand. Repeat these steps for all the deformation chains that need to be created on the current puppet's view. These chains are now the default deformation chains that will be used on all drawings not using a custom deformation chain.